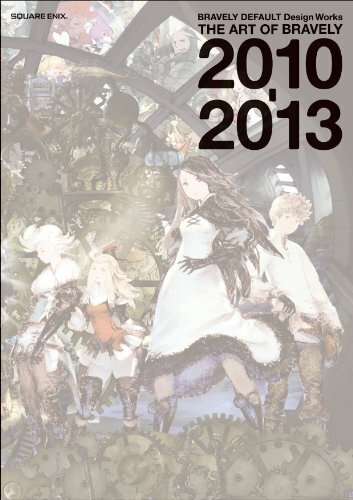 BRAVELY DEFAULT Design Works is the artbook for Nintendo 3DS RPG Bravely Default released in 2012. Bravely Default is sort of a spiritual successor to Final Fantasy: The 4 Heroes of Light that was released in 2010. That's probably where the '2010-2013' in the book title comes from. The focus is on Bravely Default of course and the Final Fantasy portion is small. The book's a 256-page paperback. It features a translucent dust jacket that's a weird choice because it hides the beautiful cover art behind. The paper is a mixture of thinner matte and semi glossy. Artworks on the matte paper appear much darker and sometimes details are lost in the shadows. The book is heavy on character designs. There are lots of characters, sketches, different views, different costumes, monsters and props. You'll see chibi versions of the characters as well as their more proportionate versions. I really like the style of the chibi characters which have a very cartoon-feel to them. Monster designs are in a style you see a lot from old school Japanese RPGs, not too far off from games such as 7th Dragon or Sekaiju no Meikyuu. Main character designer is Akihiko Yoshida (吉田 明彦) working for Square Enix. Some of his works have appeared in the Tactics Ogre artbook which is also worth checking out. The few pages of environment art are nice, the landscapes and interiors. They are coloured with accompanying line art versions. Some details are lost in the darker parts because of the quality of print on the matte paper. Last few pages feature a gallery of artworks from guest artists. I could not figure out if they are actually from the games because the characters here look quite different, probably due to the fact that I haven't played the games before. But in the section, the art style is quite different from the rest of the book. The illustrations are beautiful nevertheless. Overall, it's a wonderful video game artbook. Recommended to fans of the game and character designs.